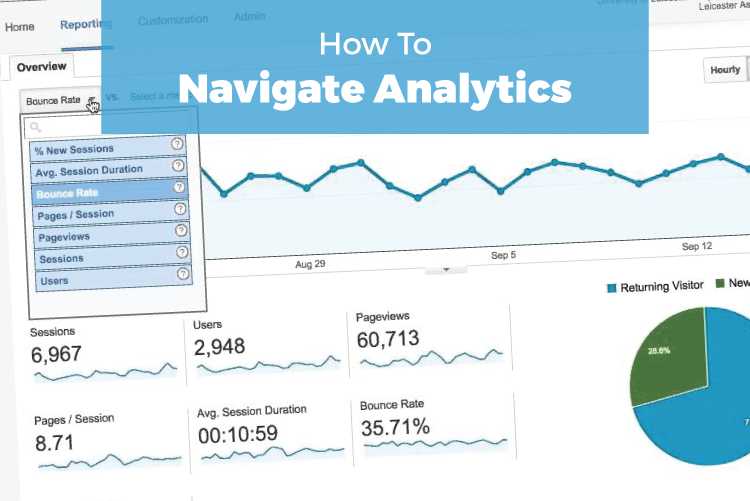 “Step one for each and every one of us is to accept and recognize the fact that Web Analytics might be having a lot less impact than it should,” said Avinash Kaushik, one of the most renowned Google Analytics experts. We’ve all realized over the past few years that it’ll be pretty difficult to measure progress and plan a strategy without analytics. Of course, there is a catch. Google Analytics has a wealth of information that, let’s face it, can be super overwhelming. There are other sources for reporting, as well, but for purposes of this post I’ll be talking just Google Analytics, since it’s the most used and cohesive platform. So what are the most important takeaways for someone looking into their analytics and ROI? Which tabs should you pull up, and what does all that information even mean? Fairly self-explanatory, but these are basic stats with which to feel comfortable. You need to know the number of users that generally frequent your site, and how long they spend there, so that you can determine a baseline. From this point you’ll see when your traffic is busier or slower. You can learn what days are most and least popular, and tailor your content accordingly. You’ll be able to determine if visitors are spending too little time on your site, and can therefore invest in more quality content to keep audiences engaged. To begin with, these stats should be considered on a page-by-page basis. So for our hypothetical let’s take the About Us page of a website. The higher the bounce rate for this page, the more people came to this particular page, and then left it before clicking through to another page. The higher the exit rate, the more viewers traveled around your site, and left from this page. Exit rate can be misleading, since everyone has to leave your page at some point. High bounce rates, however, mean that that’s the only page the viewer visited. It means nothing compelled the viewer to further explore your site. You can combat this by offering more quality content, CTAs that encourage clicks, a user-friendly experience so people know where to explore, and other options. The top landing pages show which pages of your site are attracting the most visitors. This loosely reflects the pages with the best content, and/or the pages that are best marketed. The top queries shows which keywords are organically bringing viewers – valuable information to know for SEO purposes. One tab breaks down how much of your traffic comes from each source – direct, organic, referral, and social. Familiarity with traffic can help determine how you’re directing your efforts. For example, if you’re spending a significant amount of resources on social media, but seeing very little traffic from there, something is definitely wrong. GA provides a really impressive list of demographic analyses, including age, gender, geographic location, language, and more. It can also track the type of operating system viewers are using, and whether they’re visiting from a desktop, tablet, or mobile device. All this information helps you determine your audience. It’s how you know what platforms are being utilized. How you determine tailoring your marketing to meet your audience. Conversions are basically goals in Google Analytics terminology. These can be set to track a variety of deliverables, such as how many times users spend a certain amount of time on your site, or how many times users visit a certain number of pages. Conversions are especially great for ecommerce sites, so you can track how many purchases were made. One clever idea is to track how many times viewers visited the thank you page that form submissions auto-direct toward. What are we missing? Let us know in the comments if there are any other metrics you love to track.